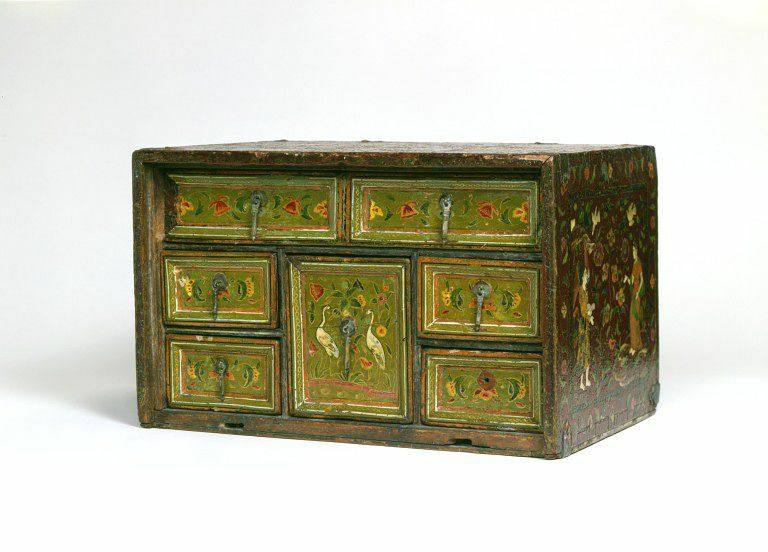 This shape of this Indian cabinet is based on a European form. The form dates from the 16th century, and furniture makers in Asia reproduced it in large quantities for European patrons. 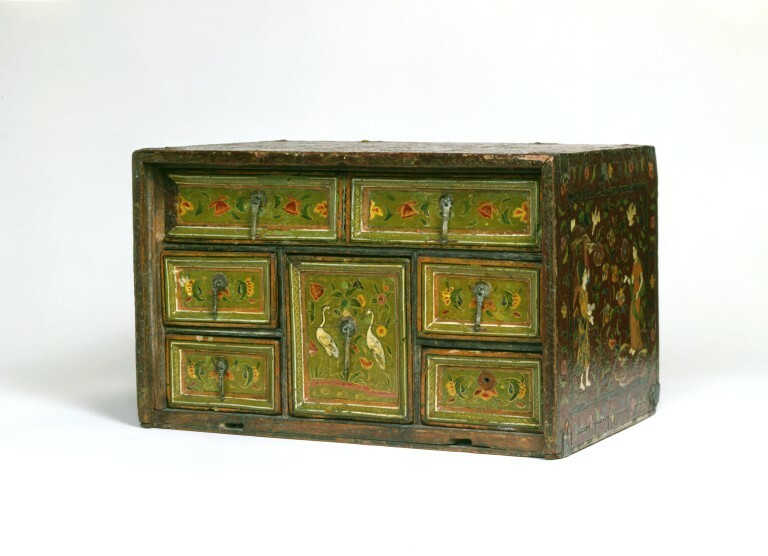 However, the painted surface of the cabinet is in a provincial Mughal style. It is an example of how Mughal painters applied their talents to a variety of media. The hunting party is a popular subject in Mughal painting. However, these scenes are not of Mughal princes, but of Europeans. They are dressed in an early 17th-century style, but in colourful clothes that are not part of conventional European male dress of the time. The Europeans are carrying guns with long barrels and slender stocks. This type of gun is an Indian matchlock musket known as a toradar. The Portuguese introduced firearms to India. So too did the Mughal emperor Babur, whose success at the Battle of Panipat (1526) was apparently due to his troops being armed with imported guns. The right side of the cabinet depicts The Annunciation. This is the moment when the Angel Gabriel revealed to the Virgin Mary that she would give birth to the Messiah. Christian paintings and printed works inspired this choice of subject. The Roman Catholic Jesuit missions had introduced them to the Mughal court in the 1580s and 1590s. However, Mary (Maryam) also figures prominently in the Qur'an, in which she is revered for her purity. Fall-front cabinet, wood, painted and varnished. Various scenes are painted on the cabinet: on the right side of the casket is a woman and an angel, denoting the Annunciation. Images on the back and left side of the box portray a group of European men taking part in a hunting party. Their dress is consistent with early seventeenth-century style, although they are more highly coloured than conventional western dress of the period. In Western painting the Virgin is usually shown indoors in a contemplative attitude, typically with book in hand. The Angel Gabriel stands proclaiming his message, while a dove symbolizing the Holy Ghost descends in her direction. The depiction of the Virgin Mary on the box is somewhat unconventional. Apart from the inclusion of two doves, rather than one, we find that the Virgin is not the modest Madonna of Western art who is draped from head to foot and bears a demure, submissive expression. Instead, she gesticulates with bare arms, her head uncovered, and adorned with rich necklaces, with flowers strewn in her hair. The probable model for the Virgin on the box is not a traditional representation of Mary, but an allegorical figure of the type found in engravings circulated by Europeans at the Mughal court, which court artists copied, reworked and conflated with other religious and courtly scenes. The back and left side of the box depict a hunting party, a popular subject in Mughal painting. However, these scenes are not of Mughal princes, but of Europeans. The figures on the left side are engaged in hunting a pair of fowl, while those on the back are celebrating their catch, the central figure sitting on a carpet in the Indian style, while an Indian servant parades before him the game that they have shot. The Europeans are dressed in an early seventeenth-century style, but their garments are more than usually colourful and depart from contemporary Western conventions of male dress. It is known that Europeans in India had their own fashions copied in local textiles, and this may account for the curious mixture of colours on the doublet, breeches and cloak. Some of the figures are wearing necklaces and strings of flowers in their hats. The former, although worn as prerogatives of rank or station at home, would not ordinarily have been donned for hunting. Judging by the long barrel and slender stock, the Europeans are using toradars, Indian matchlock muskets. Firearms were introduced to India by the Portuguese, as well by the Mughal emperor Babur (reigned1526-30), whose success at the Battle of Panipat (1526) was apparently due to his troops being armed with imported guns. 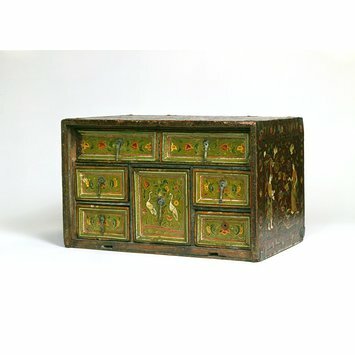 Fall-front cabinet, wood, painted with Annunciation and hunting scenes, and varnished, Western India, early 17th century.